Note: This feature was scheduled to run in the Kansas City Star. Because of our language barrier, Kawabata Makoto requested an interview via e-mail. Unfortunately, the Mothers’ touring schedule didn’t give Makoto much time to respond to my questions. His short answers necessitated using quotes from the band’s Website. Ultimately the feature was shelved. 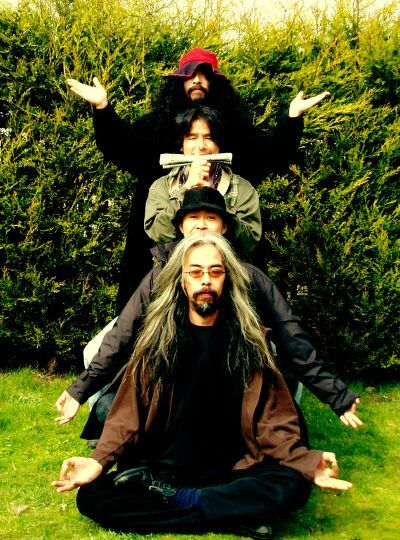 The Acid Mothers Temple welcomes all, but entry can be daunting. The ambition of Kawabata Makoto, the founder and leader of the Japanese rock band, is both impressive and intimidating. For fans, the group and its affiliated side projects has released more than 80 titles since forming in 1995. For musicians, Makoto offers several homes across Japan where musicians can jam and do whatever they like. There is a good chance, however, that neighbors will report these free spirits as terrorists. It’s not unusual for a Mothers’ composition to reach well beyond 20 minutes. Makoto wears his influences like badges of honor, naming albums in homage to Pink Floyd, Miles Davis, Frank Zappa, Jimi Hendrix and Led Zeppelin. The music often sounds like an update to the rock scenes in Haight-Ashbury and London in the late 1960s. Psychedliec rock may be an easy handle to hang on the band, but Makoto prefers the term trip music. The writing and recording process is relatively straightforward. Makoto gathers whatever musicians he can find in a collective attempt to record whatever he is hearing in his head. Beyond that, anything goes. Makoto formed his first band in 1978, when he realized there was nothing on the radio like the sounds in his head. Completely self-taught, Makoto and his bandmates played through trial and error. It took four years, Makoto said, for him to realize there was a standard way to tune the guitar. The Mothers’ were the final act of last year’s Middle of the Map festival. Unfortunately, their start was delayed and the band was unable to play a full set. Makoto is hoping to play a full set this visit. In his many trips around the world, Makoto has noticed audiences behave differently depending on the country. With Makoto’s AMT label dropping new albums in March, April and May and the band a third of the way through a six-week tour, it doesn’t look like the Mothers will be slowing down anytime soon. But Makoto knows there may be a day when his days of exploring new sounds and textures will come to an end.